TO WRITE THE GREAT AMERICAN NOVEL: Vaughn has a flair for words that makes her the unofficial diplomat of the foursome. She’s great at keeping it together for everybody–but herself. TO MARRY A PRINCE: Sassy Reenie can break hearts as easily as she can take out a bully without breaking a nail. But her live-for-today attitude leads to a tragic mistake that will haunt the girls for years. TO BE FAMOUS: From the ashes of a ravaged home life, amid rumors and bad feelings, Susan rises to fame as a glamorous network anchorwoman, proving that success is the best revenge. But forgiveness is another matter. TO RUN THE WORLD: Audrey is the ultimate overachiever, but this takes a devastating toll on her health, her career, and her family. Perfection is a race where the finish line keeps moving. What will she sacrifice to win? 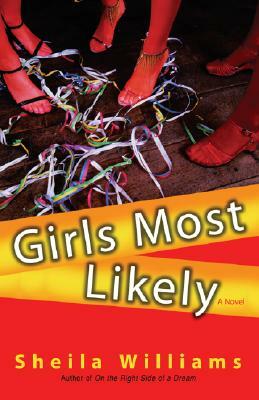 Girls Most Likely is an emotional, uplifting, often hilarious glimpse into the lives of today’s ever-changing African American women, sustained by love, laughter, and sisterhood.